The World Will be Destroyed by Fire Today! Well, there was no evidence of a widespread rapture event on May 21, 2011 and the dead didn’t clamber out of their graves and float skyward. This came as a shock to those followers of doomsday preacher Harold Camping who had quit their jobs, sold all their possessions and maxed out their credit cards in anticipation of their imminent demise. According to Camping, the rapture did actually occur, but it was a stealthy rapture that passed unnoticed by the faithful and nonbelievers alike. Now, Camping asserts that the world will end on October 21, 2011, when it will be destroyed by fire. This time there will be no billboards, pamphlets or $100 million advertising outreach campaigns to the public. Camping does not believe that the world will end in a flash and a puff of smoke. Rather, he thinks that the end will arrive very, very quietly. 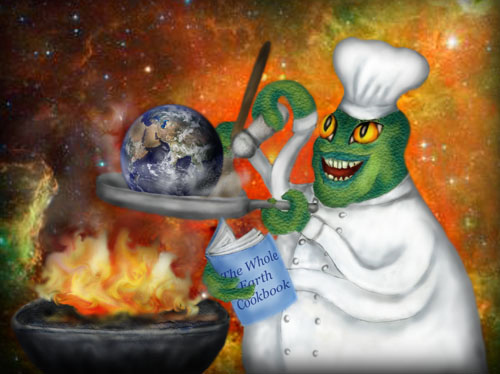 However, Camping had no idea that world’s destiny was to slowly simmer over low heat until crispy and then be briefly flambéed with a celestial cognac for the dining pleasure of a group of hungry extraterrestrial beings. So folks, cancel all your appointments and break out that good bottle of wine that you have secreted away in the cellar. You won’t be needing it for the holidays, so you had better enjoy it today before global warming takes on an altogether new meaning. In any event, if this one doesn’t pan out, there is always the December 21, 2012 apocalypse predicted by the Mayan calendar that will be triggered by the alignment of the planets and presided over by the Aztec feathered serpent deity Quetzalcoatl.